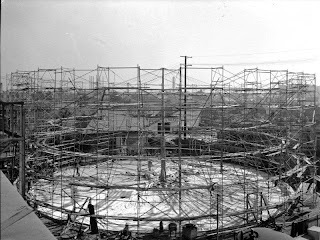 Jeffrey Head's fascinating article, 'Bubble' born, then burst in the December 31, 2011 issue of the Los Angeles Times immediately brought to mind a recent article I have been working on which delves into the structural aspects of dome-like structures. 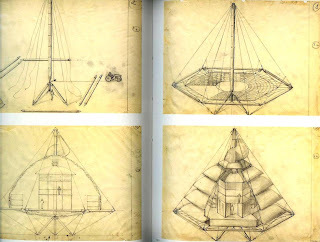 (See Living Lightly on the Land: Bernard Judge's "Triponent" and "Tree" Houses). 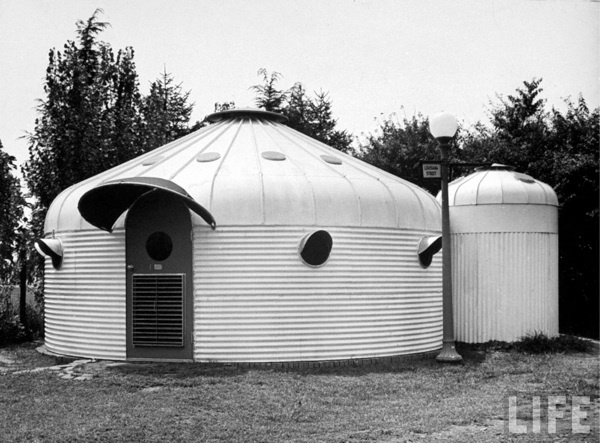 Head's in-depth research into the pioneering Airform work of Wallace Neff has resulted in a new book, No Nails, No Lumber: The Bubble Houses of Wallace Neff just released by Princeton Architectural Press which I just ordered. 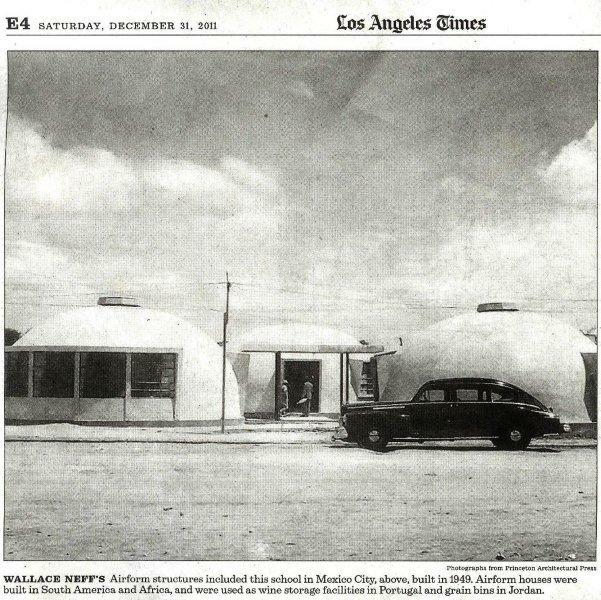 Head's book will seemingly build upon the solid foundation laid by Diane Kanner in her chapter "The Bubble House" in the highly recommended Wallace Neff and the Grand Houses of the Golden State in which the below photo appears. (See my William Krisel and George Alexander in Hollywood for more on Neff's Beverly Hills houses for Hollywood celebrities and Frederick L. Roehrig: The Millionaire's Architect for details on Neff's childhood in La Mirada). Industrial Laundry for Pacific Linen Supply, Vernon, 1944. 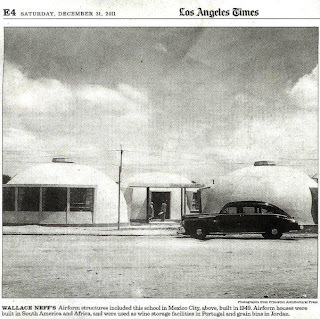 Wallace Neff, Architect. Photograph by Maynard Parker courtesy Huntngton Library Maynard Parker Collection. 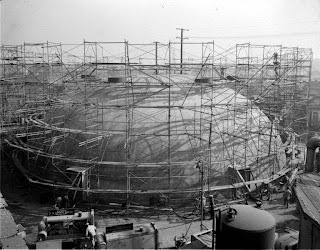 The above and below Maynard Parker construction photos of Neff's largest realized Airform project, 32-ft. tall and 100 ft. in diameter, constructed in 1944 to house an industrial laundry for the Pacific Linen Supply Co. indicate the use of a central mast to help hoist and support the Goodyear Neoprene balloon (see below) used as the interior form for the sprayed-on gunite outer wall. (For more photos go to the Huntington Library's excellent Maynard Parker Collection). Central mast used to facilitate construction of the Pacigic Linen Supply laundry facility. Photograph by Maynard Parker courtesy Huntngton Library Maynard Parker Collection. 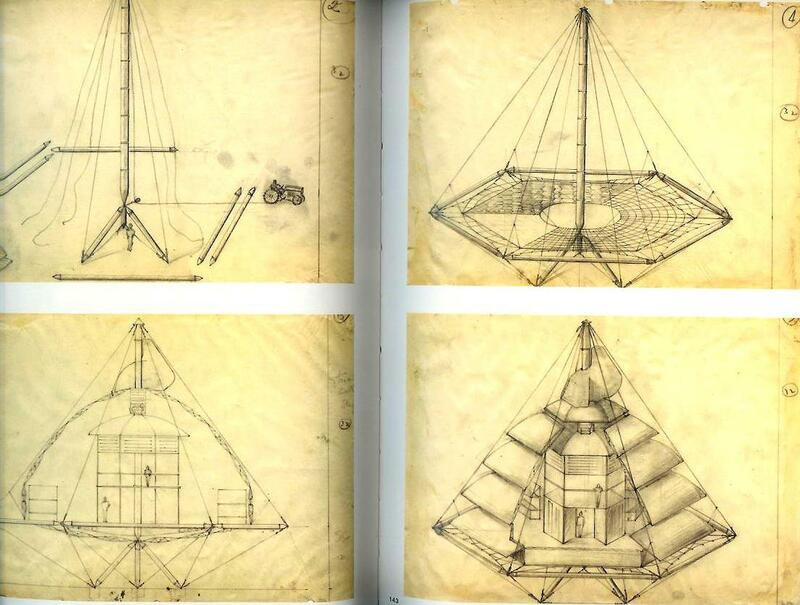 Early Buckminster Fuller Dymaxion House studies, 1927. (From "Your Private Sky," pp. 142-3).). 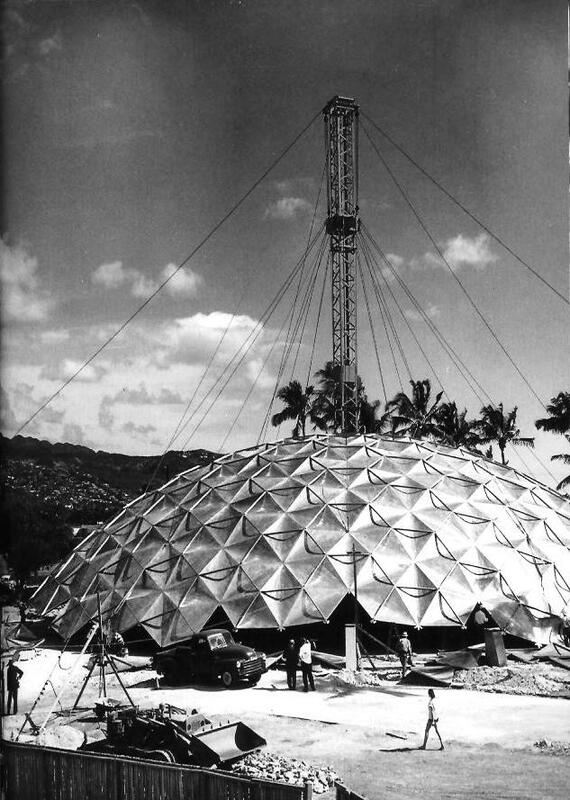 Having begun his conceptual "Dymaxion House" central mast investigations as early as 1927 (see above), I couldn't help but think of the similarly employed mast in the erection of the Buckminster Fuller's patented design of the first ever aluminum dome at Henry Kaiser's Hilton Hawaiian Village in Honolulu in 1957. (See below). 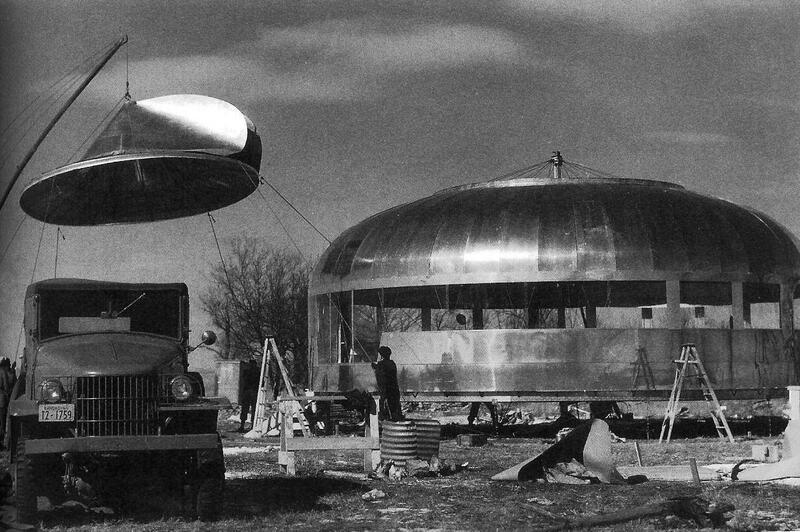 Fuller and Neff were undoubtedly aware of each other's experimental work as they both had similar visions of landing war-time housing contracts which never came to fruition. Both Neff and Fuller patented their designs but Fuller was much more successful in globally licensing and marketing his concept. (See Living Lightly on the Land). 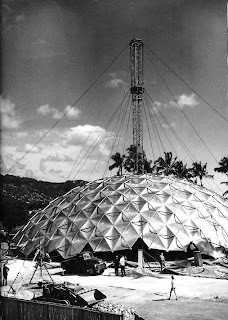 Hilton Hawaiian Village Dome, 1957. 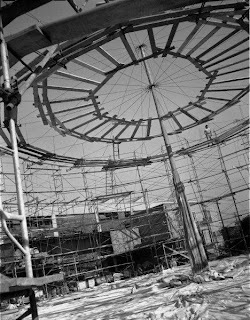 After 15 working hours about two-thirds of the dome is completed. (From "Your Private Sky," p. 383). 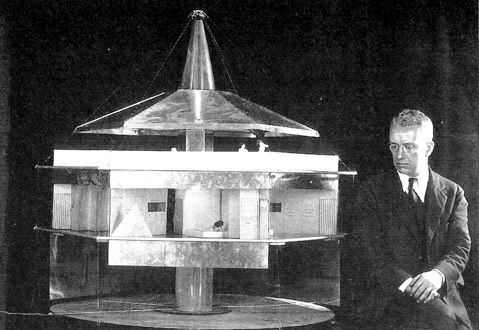 Model a parametric version of Buckminster Fuller’s Dymaxion House, ca. 1930. From DesignByMany. 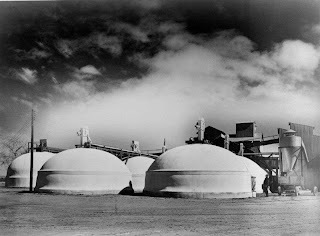 Goodyear Tire and Rubber Co. Airform Storage Bins, Litchfield, AZ, 1943. Photograph by Maynard Parker courtesy Huntngton Library Maynard Parker Collection. In his Los Angeles Times piece, Jeffrey Head stated that Neff's Airforms were used for wine storage facilities in Portugal and grain bins and Jordan. 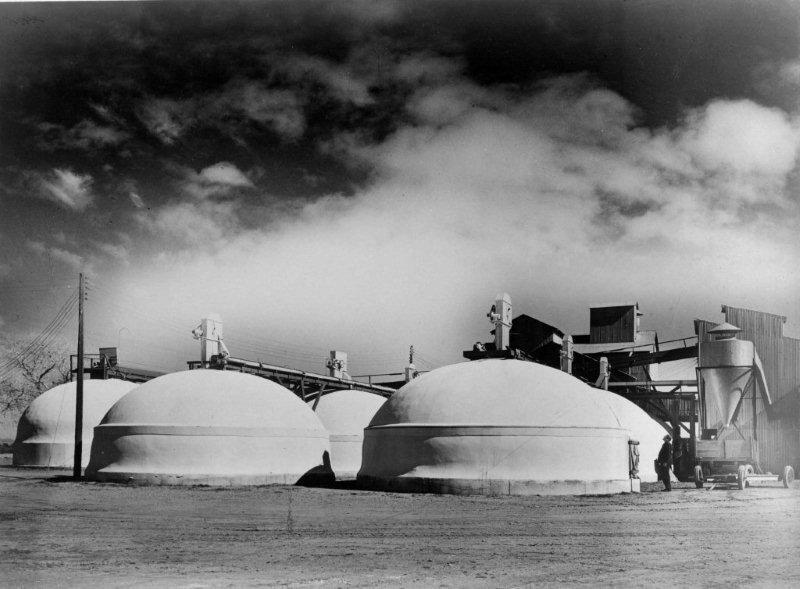 The above image from the Huntington Library Parker Collection also includes Airform grain storage bins built in Litchfield, Arizona in 1943. Ironically, during World War II Fuller was experimenting with ways to adapt off-the-shelf Butler grain storage silos into cheap, low-cost housing. (See below). Materials shortages during the war fostered endless experimentation and innovation into construction materials and building techniques that would bode well for the post-war home-building industry. 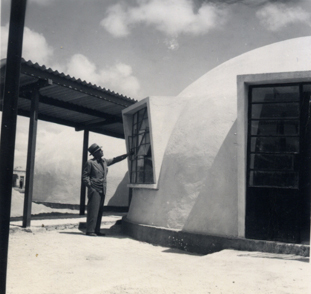 Wallace Neff inspecting Airform House. Photograph by Maynard Parker courtesy Huntington Library Maynard Parker Collection. 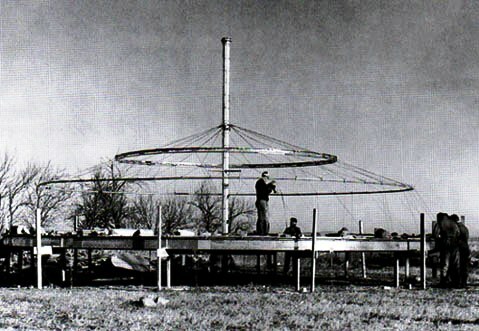 Dymaxion Deployment Unit ca. 1941. Image courtesy of the Google-hosted LIFE photo archive. Dymaxion Deployment Unit under construction, 1940. (From Your Private Sky: R. Buckminster Fuller , edited by Joachim Krausse and Claude Lichtenstein, Lars Muller, 1999, p. 214). Fuller's earlier studies coupled with his anecdotal accident of seeing a grain bin, led him to develop the version of the Dymaxion Deployment Unit seen above. Commissioned by the army for field housing, hundreds of these units were shipped to the Persian Gulf during World War Two. 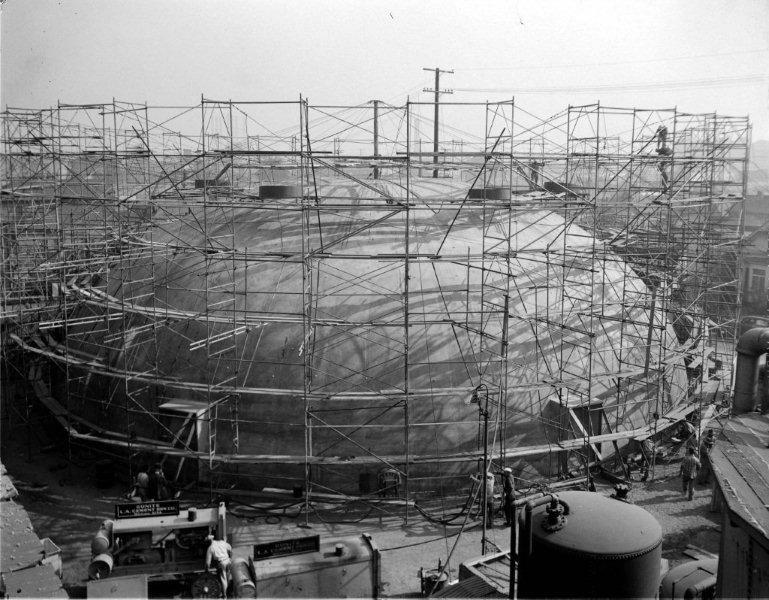 Fuller's continued research into this production method led to the development of the Wichita House in 1946. (See below). Installing the ventilator on the Wichita House, Wichita, Kansas, 1946. From "Your Private Sky," p. 245. "Wallace Neff sort of adopted me. He came over to my office many times. The stuff I was designing seemed to fascinate him. 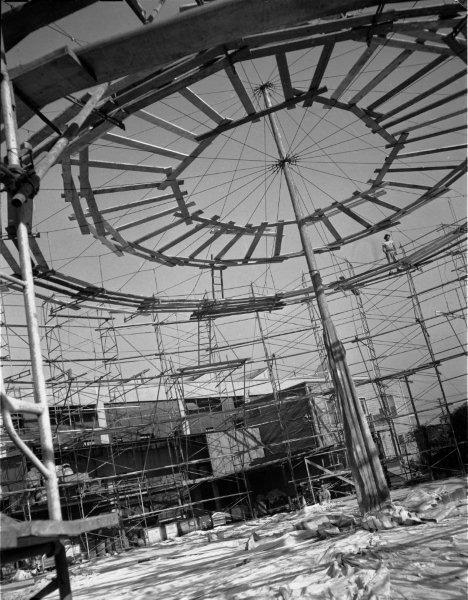 I think he was a frustrated structural form enthusiast but had never met anyone who actually had familiarity with them. The only engineering I actually did for him was his Mexico gunite domes. (See below). 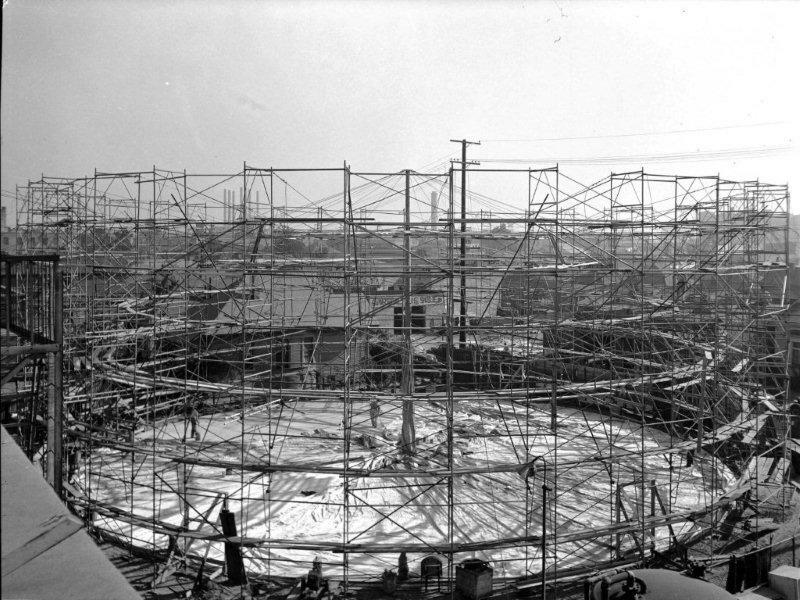 They were built and I guess they used the Goodyear forms to build them." (Richard Bradshaw to John Crosse e-mail, December 31, 2011). Head, Jeffrey, 'Bubble' born, then burst, Los Angeles Times, December 31, 2011, pp. E4-5. Diane Kanner interestingly wrote in her Neff biography that the above 1949 Mexico City school composed of seven Airforms was painted by renowned muralist Diego Rivera. (Kanner, p. 194).